When we launched the Caring Stars award program in 2012, it was the first award program of its kind to recognize assisted living and memory care communities based on consumer ratings and reviews. Online reviews (and social media) were still relatively new to our industry, and we had the largest collection of senior care reviews online. By using this extensive feedback to highlight the best communities, we envisioned that the program would both help family caregivers and older adults in their search and selection for assisted living or memory care, and provide insights to community operators about the senior living preferences of residents and their family members. For the first five years of the program, the criteria stayed the same — we required a collection of recent and positive reviews, a high overall rating, and response to all negative reviews, for example — and only assisted living and memory care communities could qualify. For 2017, we’re raising the criteria bar significantly and will expand the program to include independent living communities, non-medical home care agencies, care homes, and assisted living and memory care communities. Before we head into this new territory, though, let’s look back through the years and share some of the honoree highlights. As you’ll see, previous years’ Caring Stars have had twice as many inquiries and move-ins as partner listings without the award, achieved local media coverage, boosted staff morale, and differentiated from their competitors. We honored 120 communities in 24 states that first year. These Caring Stars of 2012 were promoted in our Caring Suggests newsletter (reaching hundreds of thousands of family caregivers and older adults nationwide), we featured them on our Facebook and Twitter profiles, and sent them certificates for their lobbies. The Caring Stars of 2012 were also included in media coverage on Senior Housing News and in local newspapers, like the Florida Times-Union / Jacksonville.com. As more communities began learning about and prioritizing senior care reviews online, and as excitement for the new Caring Stars program built up, the winner list grew to 383 communities in 40 states in 2013! More winners began to showcase their award in their lobbies, on their websites, and in their local newspapers, including the Gwinnett Daily Post, The Dallas Morning News, The Florida Times-Union, Savannah Morning News, Sarasota Herald Tribune, The Orange County Register, and others. We started analyzing the reviews on winner listings to identity service trends, turning that into an article for consumers on our site: Top Assisted Living Trends – What You Can Expect From a Great Assisted Living Community. In 2013, we also published interviews with Caring Star community leaders, to give further insights to consumers about what makes these communities so special. Included in this series are: The Bristal at Lynbrook, American House Sterling Heights, Azalea Estates of Fayetteville, Broadmore at York, and Elmcroft of Arlington. It was this year that the Caring Stars program was recognized in the National Mature Media Award category for Consumer PR campaigns. In 2014, there were 400 senior living communities in 38 states who were recognized as Caring Stars, and our team began visiting some of the winner communities. 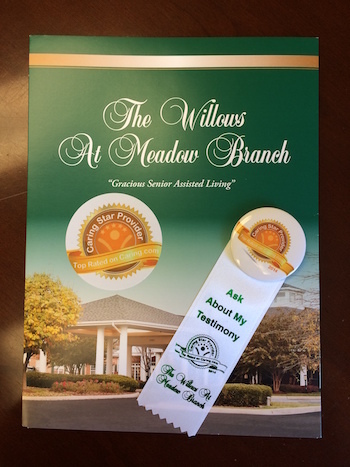 The Willows at Meadow Branch in Winchester, Virginia earned the award for the first time. There were only 10 winners in their state that year, and they were so thrilled to be honored. 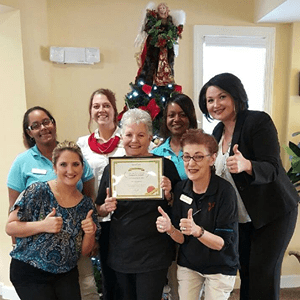 Their community is highly competitive with another local assisted living community, and they used the Caring Star award to differentiate themselves by showcasing the recognition in as many ways as possible. For example: They took the award badge and created staff lapels, ribbons, and outdoor banners, updated their information packets, and put the award on their billing statements to gently remind their customers about the high quality of their services. At their press conference and award ceremony, they invited some of the folks who had posted reviews on their Caring.com listing to come share their testimony and join in the celebration. They also sponsor a local community event and transported their residents to it in vintage cars with Caring Stars window decals. They put the award badge on unique wine glasses, napkins and other decorative items to proudly display this distinction to the public. 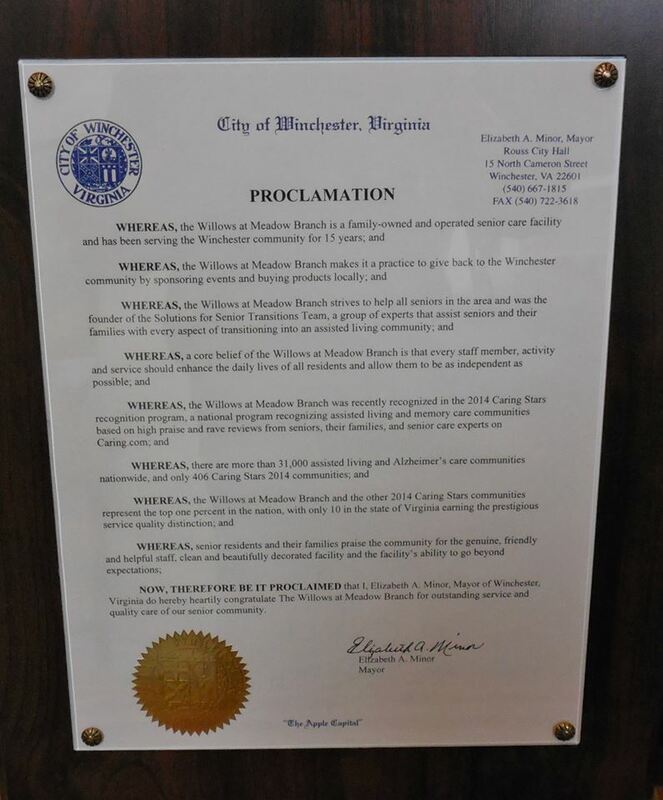 They were also successful in generating media coverage (including local radio spots), and even received a mayoral proclamation from the City of Winchester. In the weeks following the announcement, when I contacted their marketing director, she was very busy processing many new move-ins. 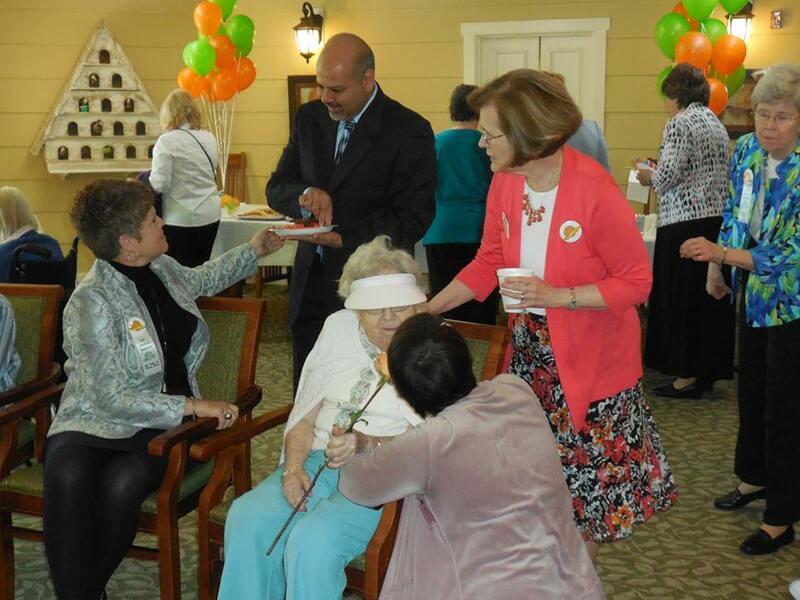 Another Caring Star of 2014 was Atria at Willow Glen. We visited one of their monthly resident meetings to present the award to their executive director and staff, and enjoyed refreshments with the residents. At that particular meeting, the executive director polled the residents about their social media use, and many hands went up when he asked if they were using Facebook, Twitter, and Pinterest. The event was covered in their local newspaper too. To help all Caring Stars with their social promotions, we started offering some image “memes” they could use on their social profiles and websites — here’s example from the page of New Hope Valley Assisted Living & Memory Care Community. We posted them on our profile too. Like prior years, the Caring Stars of 2014 were in the media spotlight, with coverage on Senior Housing News, The Tampa Tribune/The Sun, Ambler Gazette, Midland Daily News, The Pilot, and others. In 2015, the honoree list doubled to 805 assisted living and memory care communities in 43 states. That year, we unveiled a new top-tier or elite honoree group: the Caring Super Stars, which is communities that have earned the award in the present year and two other years (for a total of 3 or more years as a Caring Star). 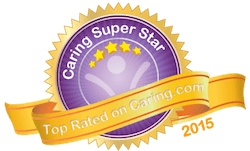 Like we had done in prior years for the Caring Stars, we had a senior care expert take a look at reviews on the Caring Super Star listings to identify trends among the “best of the best” in assisted living and memory care, turning that into an article for consumers on our site. The Caring Super Stars of 2015 were also featured at our booth at the annual Argentum (formerly ALFA) conference, where we too earned an award for digital marketing. 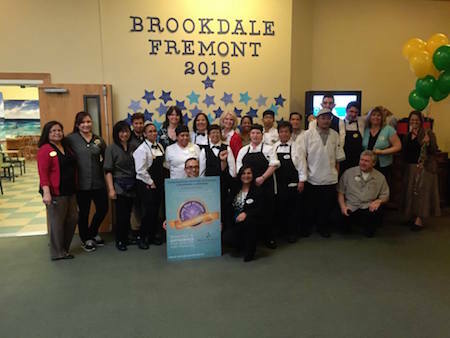 Brookdale at Fremont was among the winners in 2015, and they held a party for residents, residents’ family members, and staff to celebrate. They were only one of four winners in their county that year, and were featured in their local newspaper as well as on the national website Senior Housing Forum, after taking Steve Moran on a tour. Many winning communities incorporated the badge into their Facebook or website pages, and we particularly loved the photos we saw of residents and staff celebrating, such as this pic on Facebook from Robbinswood Assisted Living in Grand Haven, Michigan or this pic on Twitter from Shelby Crossing Health Campus in Shelby Township, Michigan. Some communities posted photos of their lobby certificates, such as Lorien Health System’s Harmony Hall, Somerby of Mount Pleasant, and the The Terraces of Roseville. It was another great year for media coverage as well, with clips on: Senior Housing News, Providence Business News, KCBD NBC 11, Lubbock Avalanche-Journal, The Oklahoman, WIOD-AM 610, BizTimes Milwaukee, the Santa Cruz Sentinel, WOBM 92.7FM, the Westford Eagle, The Clarion-Ledger, The Times – Northwest Indiana, Paso Robles Daily News, The Aging Experience, The Island Now, and more. We announced the Caring Stars of 2016 at the annual SMASH sales and marketing conference, with a list of 787 communities in 44 states. For the first time, we revealed publicly some of our data about the impact of being a Caring Star. Specifically, after analyzing winner listings over a two-year period and comparing them to referral listings without the award, we found that on average Caring Stars get twice as many consumer inquiries and move-ins! 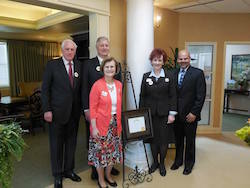 That drummed up media buzz and attention for Caring Stars winners again, with coverage on: Senior Housing Forum, the Long Island Herald, Redlands Daily Facts, TBNweekly.com, , ValpoLife.com, The Osprey Observer, Berks-Mont News, The Edmond Sun, , The Courant, and more. 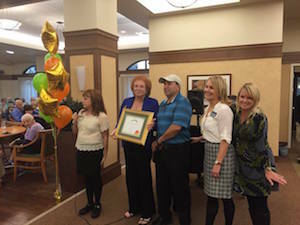 We also celebrated the award this year with the residents and staff of Merrill Gardens at Campbell. There was a piano performance, dancing, a champagne toast and much merriment in honoring this community, which is a two-time Caring Stars winner and close to becoming a Caring Super Star in the future. The social promotions and website postings continued this year as well. Pacifica Senior Living put the badge on each of its winning communities’ web pages (such as Newforest Estates), and winners linked the badge to their listings to help consumers understand the award and read the reviews. Holiday Retirement issued a press release that they published on their website. Belmont Village Senior Living and Enlivant spread the word on LinkedIn, and the memes shined brightly on Facebook pages of Bella Vista Memory Care, The Hearth, and many others. Sunshine Retirement featured their smiling staff in a post on Facebook about The Carriage House at The Verandah at Graywood, and posted a press release as well. We’ve truly enjoyed watching this award program grow in popularity over the years, and make such a difference for family caregivers, older adults, and the senior living communities listed on Caring.com. We’re looking forward to continuing this program in the years to come, with the exciting changes ahead for the 2017 award. Subscribe to this blog to get alerted when we announce new Caring Stars and Caring Super Stars each year (see right column, “Get Updates” field). Think your senior living community or home care agency should be among those honored? Get in touch with our team ASAP to learn more about how to qualify, and visit our Caring Stars info center as well. Denise Graab joined Caring.com in September 2010, and has 20+ years experience in communications, with a focus on social media marketing for the last decade. In her current role at Caring, she helps senior living communities and home care agencies understand how best to harness the opportunities of digital marketing, including getting and responding to online senior care reviews. 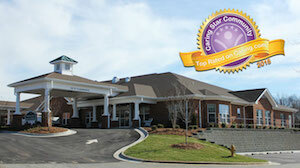 I am interested in what the criteria is to qualify for consideration or recognition of the Caring Star Award. 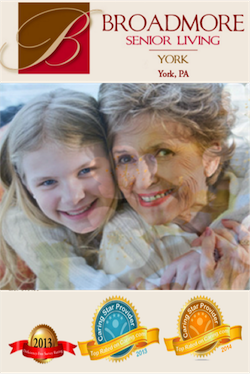 Hi MaryBeth, Please contact community@caring.com or visit caring.com/bestseniorliving to learn more detailed info about the award. Thanks! Copyright 2017 Caring.com. All rights reserved.